Ht / Wt: 6'4" / 234 lb. 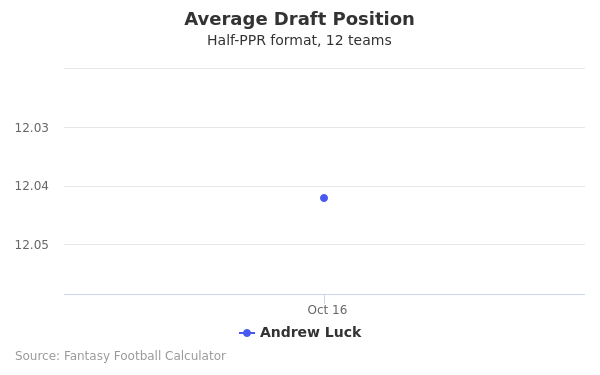 Andrew Luck's fantasy value is measured by his average draft position (ADP) in fantasy football mock drafts. In recent drafts, Luck's current ADP is 4.09, which indicates that his fantasy outlook is to be the 9th pick of the 4th round, and 44th selection overall. 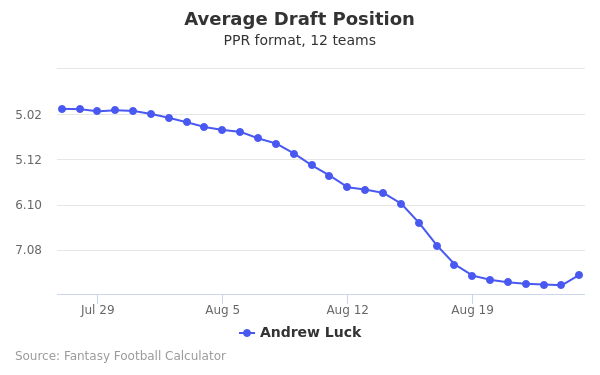 The code below will display a graph that updates every day to show the ADP data for Andrew Luck for the past 30 days in 12-team PPR leagues. Draft Andrew Luck or Kenny Golladay? Draft Andrew Luck or Kerryon Johnson? Draft Andrew Luck or Cooper Kupp? Draft Andrew Luck or Eric Ebron? Draft Andrew Luck or Robert Woods? Draft Andrew Luck or Julian Edelman? Draft Andrew Luck or Tarik Cohen? Draft Andrew Luck or Baker Mayfield? Draft Andrew Luck or Jarvis Landry? Draft Alshon Jeffery or Andrew Luck? Draft Andrew Luck or O.J. Howard? Draft Andrew Luck or Tevin Coleman? Draft Andrew Luck or Tyler Boyd? Draft Andrew Luck or Kenyan Drake? Draft Andrew Luck or Deshaun Watson? Draft Andrew Luck or Will Fuller? Draft Andrew Luck or Chris Godwin? Draft Andrew Luck or Evan Engram? Draft Andrew Luck or Calvin Ridley? Draft Andrew Luck or James White? Draft Andrew Luck or Mike Williams? Draft Andrew Luck or Hunter Henry? Draft Andrew Luck or Lamar Miller? Draft Andrew Luck or Jordan Howard? Draft Andrew Luck or Doug Baldwin? Start Andrew Luck or Kenny Golladay? Start Andrew Luck or Kerryon Johnson? Start Andrew Luck or Cooper Kupp? Start Andrew Luck or Eric Ebron? Start Andrew Luck or Robert Woods? Start Andrew Luck or Julian Edelman? Start Andrew Luck or Tarik Cohen? Start Andrew Luck or Baker Mayfield? Start Andrew Luck or Jarvis Landry? Start Alshon Jeffery or Andrew Luck? Start Andrew Luck or O.J. Howard? Start Andrew Luck or Tevin Coleman? Start Andrew Luck or Tyler Boyd? Start Andrew Luck or Kenyan Drake? Start Andrew Luck or Deshaun Watson? Start Andrew Luck or Will Fuller? Start Andrew Luck or Chris Godwin? Start Andrew Luck or Evan Engram? Start Andrew Luck or Calvin Ridley? Start Andrew Luck or James White? Start Andrew Luck or Mike Williams? Start Andrew Luck or Hunter Henry? Start Andrew Luck or Lamar Miller? Start Andrew Luck or Jordan Howard? Start Andrew Luck or Doug Baldwin? Andrew Luck showed his stellar football playing abilities early on, and he keeps getting better each year. Luck showed considerable promise as a young man in high school, and more promise throughout college playing for Stanford University. Following college, he was picked up by the Colts and quickly became their team leader. He has earned the respect of his teammates and fans. Andrew Austen Luck was born September 12, 1989, in Washington, DC. He is the son of Oliver Luck, the former Huston Oilers quarterback. As a child, Luck spent his childhood in London, England, and Frankfurt, Germany because his father was the general manager of two of the World Leagues of American Football teams. Luck returned to the States in high school and became the quarterback for Houston’s Stratford High School. He drew national attention as a senior at Stratford and some scouts rated him the fifth best prospect in Texas and one of the top 50 overall high school players. Academically, he made his mark as well and graduated class valedictorian 2008. Luck went right to college at Stanford University with a major in architectural design. He turned down other offers from top prospects because he admired Stanford’s academic programs. He played ball under a newer head coach, Jim Harbaugh. Under Harbaugh, Luck excelled during the Cardinal’s season to restore the program and became the quarterback in 2009. During the next three year’s seasons, Luck helped to propel Stanford into three straight bowl games. During college, Luck was twice named the Pac-12’s Offensive play of the year. During college, Luck was one of the NFL draft top picks, but he chose to complete his degree first. In April 2012, Luck was selected by the Indianapolis Colts as the number one pick in the NFL draft with a four-year contract for $22.1 million. Following his 40 time of 4.67 and 35 inch vertical jump. In November, Luck set a rookie single-game 433 passing yards record, with a total season passing yards of 4,374 to establish a rookie mark. He earned the first of his multiple Pro Bowl selections. As a sophomore, his passing yards dipped, but he was found to be better at avoiding costly interceptions. The biggest moment of this season came in the opening round of playoffs with the Kansas City Chiefs where he led the Colts back from 28 points behind. 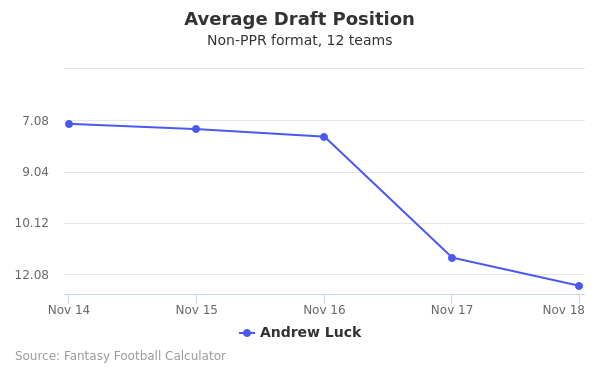 In 2015, Luck started out the season with an injured shoulder and the year did not get better. He was reported to have the worst playing season of his career. He had almost as many interceptions in three weeks as he did during the 2013 season. Luck was 7th in attempts and 15th in completions during this playing season. While he suffered the worst statistical game of his career, he did have some highlights and his luck changed with the end of the year. In 2016, Luck said goodbye to the bad luck of 2015 and was named the comeback player of the year as the Defensive Player of the year. He led the team in 1,448 receiving yards on 91 catches with 6 touchdowns. Luck signed a six-year contract with the Colts for an average salary of $23.3 million a season and a total deal of $140 million. Luck bounced back with a great season with 4,240 yards, 31 touchdowns, 13 interceptions, and 96.4 passer rating. Luck was noted to be the most formidable threat on the Colt’s team. Luck was also given the single best game performance when the Colts played the New York Jets on December 5 as he ties the game. Luck had many highlights in 2016 that combine to make it a great playing year. Luck keeps a quiet personal life with his girlfriend, Nicole Pechanec, who was a senior gymnast at Stanford University, where they met. They were both star athletes and studied architecture together. Today, they enjoy time together when they can, and she attends games with the other NFL girlfriends and wives. Luck does participate in social media with a Twitter account that has almost 20,000 followers.